It's just a sign of the times, I guess. Many kiddies and teens out there have no clue what a 45 is. 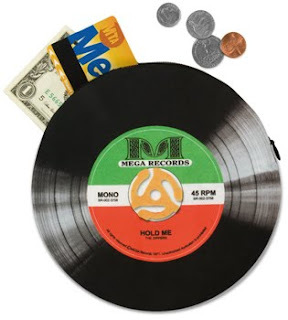 Now shuffled away along with cassettes and the archaic 8 track cartridges in the cobwebbed attic of music merchandising, 7" singles were once a thriving enterprise. I still remember my first purchase as a little kid (it's too embarrassing to reveal here), and I continued to snap them up until I earned a higher allowance and could finally spring for full-fledged LPs. Vinyl was once king, and now it can sorta be king of all your small personal belongings -- the pocket james zipper pouch can hold all sorts of valuables for you and look too cool for school at the same time. A fun musical blast from the (not so far away) past.